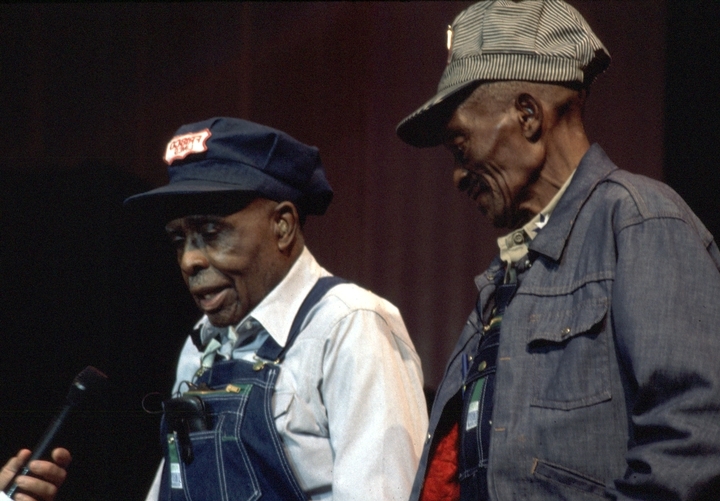 Artist John Mealing and Cornelius Wright, Jr.
John Henry Mealing and Cornelius Wright, Jr., both of Birmingham, Alabama, were callers on railroad section gangs, leading songs and chants to inspire the workers, known as gandy dancers, to perform their tasks with strength and precision. 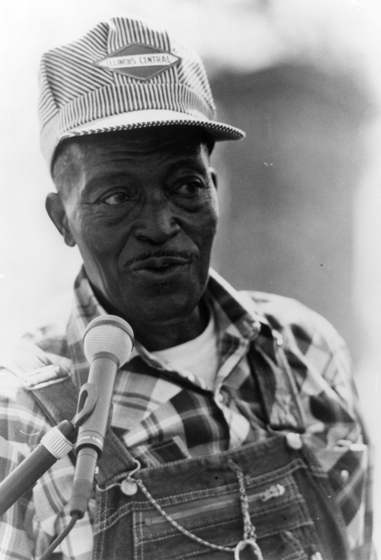 Mealing went to work for the Western Railroad as a water boy when he was 15. It wasn't long before he joined the section gang as a track laborer and caller. Being a caller was a prestigious position, especially for one so young. He recalled that many times his foreman would instruct him to drop his tools and take his turn at railroad calling with the order, "Come over here and talk your Latin!" 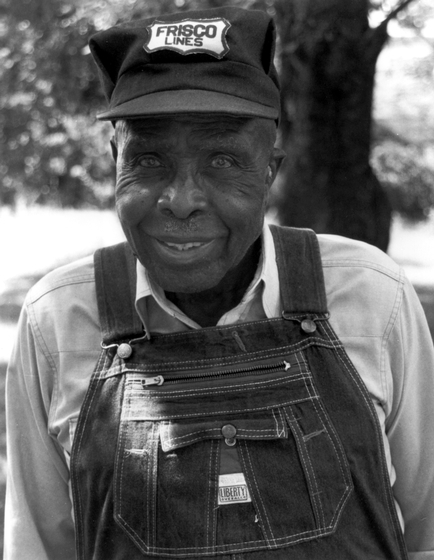 When Cornelius Wright, Jr., was 17, he began working as a track laborer for the Tennessee Coal, Iron and Railroad Company, which later was acquired by U.S. Steel. Like his father, he developed a reputation as a good caller. He explained, "Now a good caller, he does it the same as a conductor of an orchestra. Before he would call, the men would begin to rap the bars. And this is to catch the rhythm, everybody gained momentum. Like that conductor, he stands there and listens for that sound. He's ready to wave his baton." The workers had a rich repertoire of songs and chants used for their various tasks. 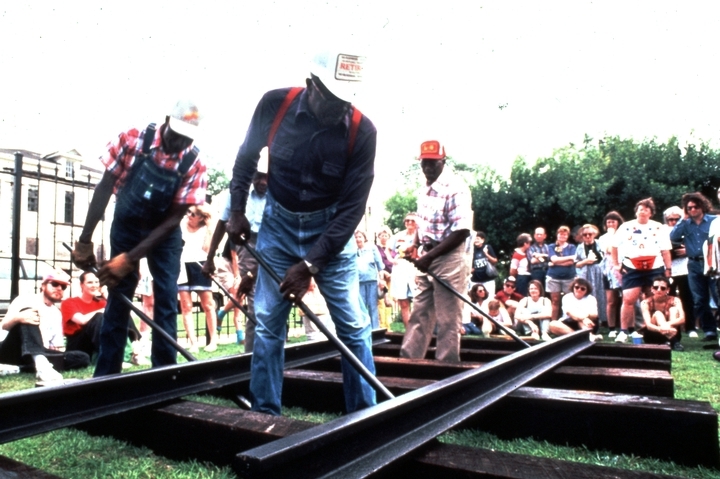 These men, working in crews of eight to fourteen, were responsible for laying and maintaining the tracks. The term "gandy dancer" apparently came from two sources: the Chicago-based Gandy Manufacturing Company, maker of railroad tools, and the dancelike movements of the men who worked with them. 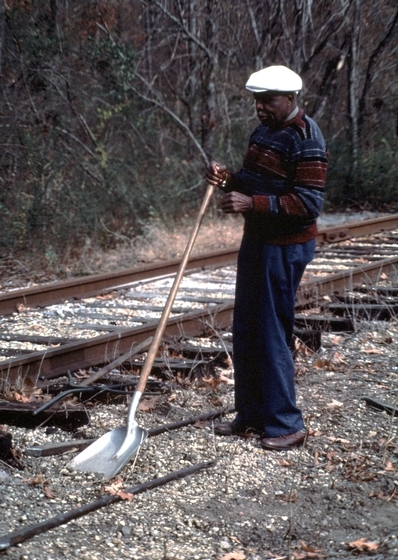 Songs were tailored to the task at hand: "lancing calls" to coordinate the dragging of 39-foot rails; slower, speechlike "dogging calls" to direct the lifting and laying of the steel rails; and more rhythmic songs for spiking the rails, tamping the bed of gravel beneath them or aligning the rails with long iron crowbars. 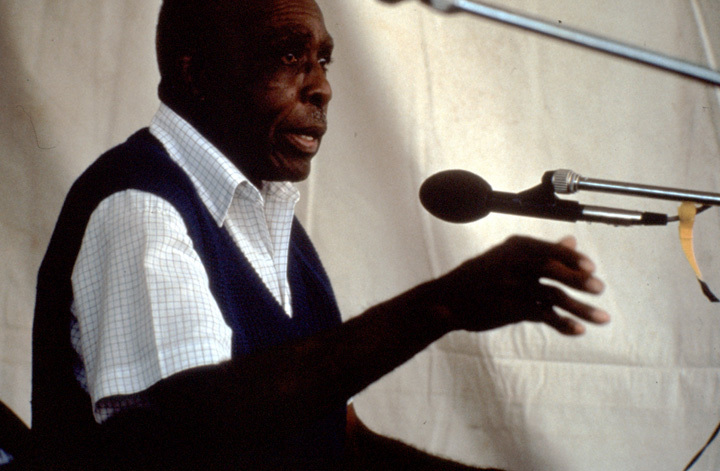 The lead singer or caller would relay the white foreman's instructions to his crew. His job was to uplift the workers, both physically and emotionally, to do their best work. Mealing recalled an incident from his early days of calling in Birmingham when the crew was having trouble moving the track. 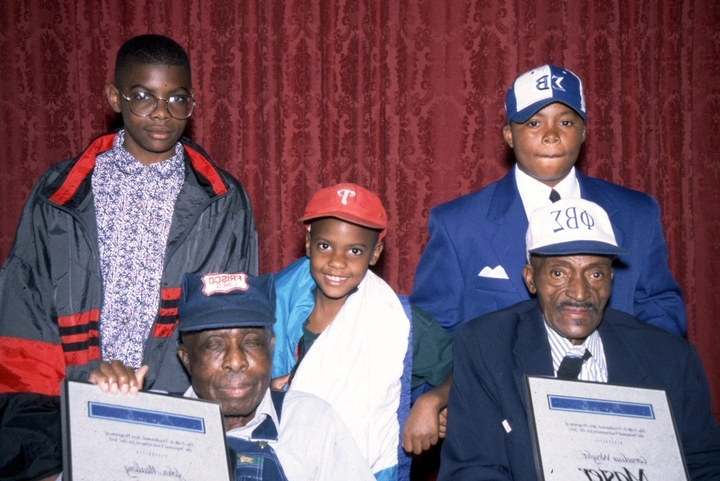 "Those boys was tired and couldn't do no good," he said. "The foreman called me over and said, 'You go down there and talk your Latin.' I started to singing, and that track started to move ... the fellows got uplifted. That's what the song was for, to make a man feel good." At times the songs also served another purpose, as a private language to convey messages that the white overseers would not understand. Topics of songs could range from Bible verses and other religious matters to overtly sexual content. As Wright said, "If you really had to move that track ... some callers would talk about the lingerie that a woman wore. Now that caused the crew to really shift that track." 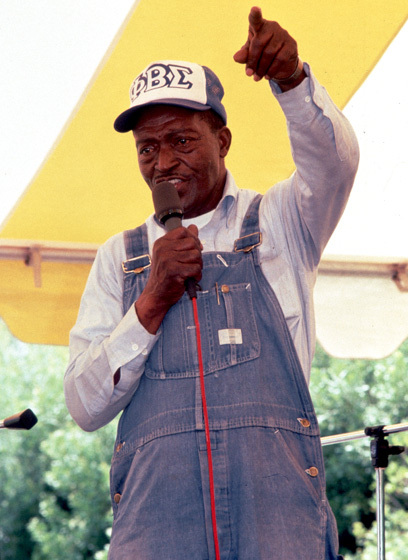 The songs of gandy dancers were in the tradition of work songs used in the fields of the South during slavery. 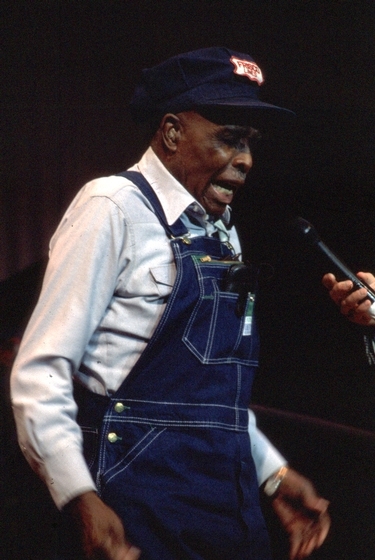 And like these field songs, the railroad songs are a close cousin to the blues. By the 1960s, as machines replaced the section gangs, the tradition was dying out. Both men retired, Wright with the title of track foreman. After their retirement, Mealing and Wright devoted much of their time to keeping the tradition alive. 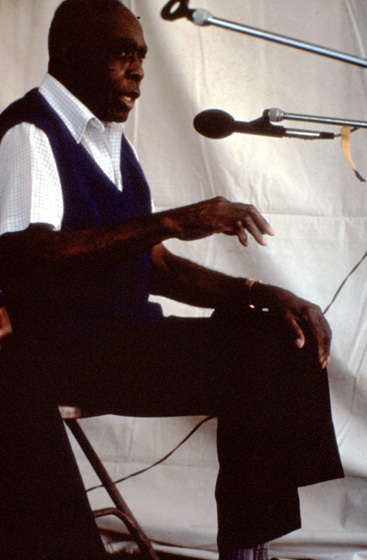 In their everyday lives, at public festivals in the Deep South and through the public television film Gandy Dancers, they continued to teach younger generations and the general public the beauty of their very functional music. In Wright's words, the gandy dancers "demonstrate that man, through songs and strength [and] coordination, was able to claim victory over seemingly insurmountable odds [moving railroad tracks] and tasks." These workers, he said, "were men of many talents and callings. They were musicians, preachers, athletes, actors, etc., who used all these skills simultaneously at times to achieve tasks that machines are called upon to do now.... Before the machine came man and men of vision and dreams." "Three Blacks Receive National Heritage Fellows Award." Jet (October 21, 1996) 90, 123: 63. Gandy Dancers. 16mm, videotape, color, thirty minutes. Produced and directed by Barry Dornfield and Maggie Holtzberg. Atlanta: Georgia Council on the Arts, 1994.